Prima Trio had a dynamic and productive week with us. It is particularly pleasing when visiting musicians are able to have an “Adirondack Experience.” The Trio structured their time in a way that allowed them several long and lazy afternoons at Chazy Lake. Boris even took up fishing, catch-and-release! 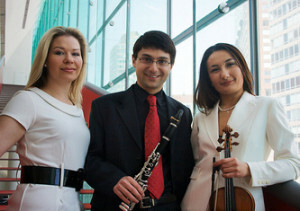 Their retreat project was to prepare new material for the 2013-14 concert season. The principal works they focused on were Mozart’s Kegelstatt Trio (clarinet, viola, piano) and Bartok’s Contrasts (violin, clarinet, piano), both big, important works, each challenging in different ways. At the conclusion of their stay they performed both pieces in a free public concert at the Saranac Methodist “Church in the Hollow,” adding also Srul Glick’s Klezmer’s Wedding to round out the program. We had a turnout of about 120, considerable for a summer Sunday afternoon, and they were unanimous in expressing their appreciation for this superb ensemble. The trio then rewarded us with an encore, Piazzolla’s Otono Porteno, which elicited in another standing ovation!